Application for ACT 22 are Now Being Accepted! ACT is a 15-week program which offers comprehensive training and turn-key business building materials for using the ARTbundance™ Philosophy of self-discovery through creativity and applying them in a variety of professional venues, including coaching, teaching, facilitating, public speaking, and consulting. Since 2009, over 400 creative individuals have gone through the ACT program, and we are about to launch our 20th iteration of this training. In the Pilot Program of ACT, I had my little newborn son in my lap…now that little baby is about to turn 11 in May! Like a growing child, ACT is changing and the world has been significantly changing around it as it has grown. When I launched the pilot of this program in 2008, I had carried out meticulous study of Coaching Programs to assess the needs that were not being met. In ACT 22, once again we have updated ARTbundance Training so that it reflects the most current trends and technologies today. ACT 22 has fine-tuned this new content to create an enriched and timely training experience that sets it apart from other programs. 2. Format Update: Providing the Most Efficient and Fun Class Delivery Possible! 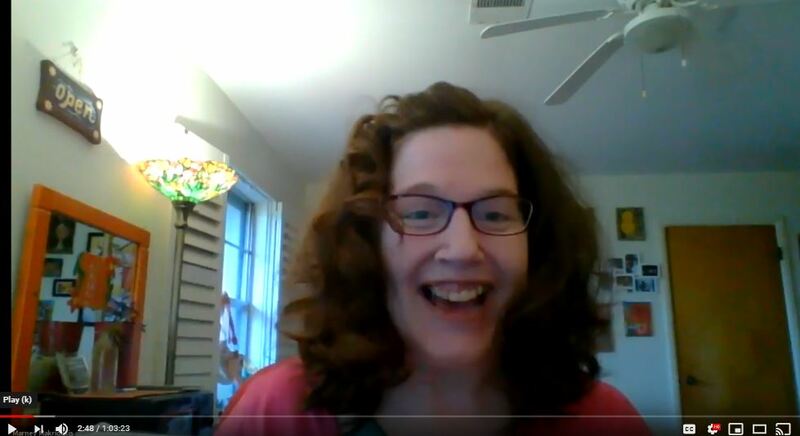 I personally lead each weekly 90-minute class teaching by video on the Zoom! platform, with visuals, whiteboards, and interactive demos for an immersive and engaging class experience. Participating via two-way video is optional, but encouraged, as much of our work is visual in format and video allows us to show our drawings, doodles, and artwork to one another. All classes are recorded if you cannot attend live. For maximum flexibility, trainees receive both audio and video recordings of each class. 8. A vibrant community website for networking, support, brainstorming and connection with your ARTbundance™ Training Colleagues. 9. Coaching Practicum: Two Live monitored Coaching sessions with “real” clients, complete with evaluations from Marney and your clients. 10. Practitioner Practicum: A one hour teleclass promoted to the Artella community. 11. 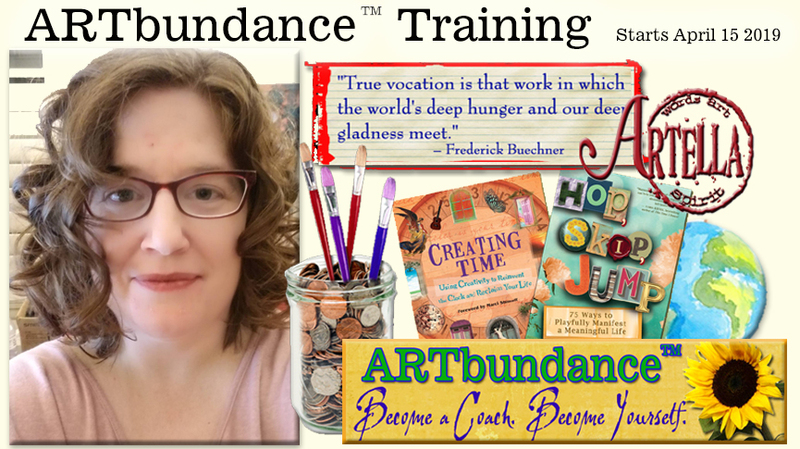 Certification Credentials – Upon successful completion of ACT, become a Certified ARTbundance™ Coach or Certified ARTbundance™ Practitioner, and we provide a certificate and accompanying graphics. 12. eProduct Licenses – 25% off all Artella eProduct Unlimited Use Licenses. This option and discount is for those who want to add an additional turn-key stream of passive income while developing their business or practice. 13. ACT Alumni Association – Lifetime membership in the group of ACT Alumni for camaraderie and collaboration. Unlike many coaching program, no annual fee or membership required. I have been developing ARTsignments™ for 17 years, and have trained over 400 coaches and practitioners since 2008. ARTbundance™ and ARTsignments™ are also the basis of creative exploration in my bestselling books from New World Library: Creating Time: Using Creativity to Reinvent the Clock and Reclaim Your Life and Hop, Skip, Jump! : 75 Ways to Playfully Manifest a Meaningful Life. ACT is a joyful, immensely promising opportunity for those who would like to use their deep interests and passion for creativity to serve and inspire others through creative and truly satisfying work. We’re now about to start the 21st session of ACT! All our training sessions have been incredible experiences, both for the fantastic Graduates and for me, getting to work and play with such amazing people! Hear more comments from participants in the Audio ACTimonials! from the ARTbundance™ Training Program, here! Browse our Directory of Certified Coaches and Practitioners! The page will open in a new tab, so you don’t lose your place here. Classes are held on Mondays, alternating weekly between 8:00pm Eastern and 1:00pm Eastern, to accommodate the different schedules and time zones of participants. We are proud to say that we have not raised our tuition at all since ACT was founded in 2009. We are committed to making this training affordable and providing excellent value what the training experience. In addition, we will be offering a very limited number of scholarships through the Lonnie D. Kliever Scholarship Fund for those in the most serious financial need. The scholarship rate is $799 (available in 1 payment, 3 payments of $266.33, or 6 payments of $133.16). If you would like to apply for a scholarship, please be sure to indicate that on your application. We only have a few additional scholarships for those in the most serious financial need, and ask that you only apply in good faith if receiving the additional monetary gift is the only way you would be able to enroll. Once you request your application, let yourself have fun with it! I want to get to know YOU and am far less interested in what you have done in the world than knowing why you are drawn to this program and process, why you are excited about it, and why it’s the right fit for you. The first is the ability to sincerely listen and identify the deep needs and desires of the person or people you are working with. The second is an affinity for creativity. This does not mean you have to be an artist, writer, or “practicing creative” – it just means that you are deeply connected to the idea of creative processes as a conduit for self-awareness and discovery. Previous coaching experience, or art/craft experience are definitely not necessary to make the selected group of applicants, nor are they going to be the primary considerations in choosing this group. Those will be helpful skills if you have them but the top applicants will be chosen based on a wide range of qualities to ensure that the program is a great match for everyone. Please send me an application for ACT 22! Read comments by ARTbundance™ Training Graduates, here. NEW! Listen to Audio ACTimonials!